The holidays aren't all fun and games for retailers, warehouses or distribution centers that can't scale to a sudden influx of orders. Even with forsight and a crystal ball there are fluctuations in demand and surprises. In a new world where the Internet handles much of holiday shopping, the online transaction is only the first of many steps to ensure the customer receives their order at their doorstep. A brand depends heavily on the ability to pick, pack, ship and deliver products on time during the holidays. While the Internet keeps the shopping simple for buyers, brick & mortar locations allow the buyer to touch and experience products first hand. Unexpected demands can cause major issues for product distribution. 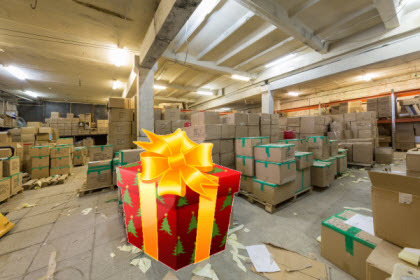 It is your job to successfully execute as an e-retailer, retail store, warehouse or distribution center as your meet the logistics and fulfillment requirements of the holiday shopping season. To ensure success, you will look at potentiall bottlenecks to avoid inventory and supply calamities and maximize sales opportunities. An understaffed or improperly trained receiving department can slow distribution. Even when fully staffed, wasted steps can create an impression of understaffing when a mobile workstation could improve their efficiency. Read this case study to learn how a pet supply company was able to increase productivity by 40%. When staff members are unable to access inventory due to organization or inventory over-crowding, orders cannot be completed and customers must wait. n production, expedition and storage warehouses, any broken link in the logistical process can lead to a buildup of supplies and inventory in the departments preceding it. Frustrated employees, supervisors and management staff causes disruptons. Symptoms of low morale can include tardiness, lack of teamwork, lack of communication and avoidance. Workers who are forced to work without the best equipment or workplace environment are stressed about not doing their jobs correctly. This causes a chain reaction whe others on staff are dependent on others who feel helpfless. A mobile workstation cart with power can empower a staff member to break free of the typical environement, avoid wasted steps and gives them more control over their workspace. Warehouse pack stations have limits. If your maximum capacity is to handle 1000 orders per day at a pack station, you can't automatically increase the capacity of that station when orders spike in November and December. Have a clear understanding of expected daily volume along with opportunities to pack orders through an alternative process to eliminate any shipping backlogs that result from gaps in pack station infrastructure and demand. It could be said that the biggest challenge during the holidays is finding qualified people to work. If you are not able to recruit, train, schedule and manage those workers in a cost effective manner, profits slip. In some cases, it might make sense to reorganize areas and pack stations, create mini assembly lines or other strategies such as "quick pick" lines that support orders for only best-selling items. Recently, a sporting goods retail chain thought differently about how to approach the bottlenecks and inventory control by integrating workstations into the workplace. The case studies will show you how they improved results with a 60% reduction in stock outs. You can read the case study here. While you look for the opportunities to batch and pack orders more efficiently, mobile workstations with power can become the means to increase both efficiencies and flexibility. You can read about how Amazon added mobile workstations to the workplace and increase productivity. Creating an open forum where employees and managers can discuss improvements in a warehouse's workflow is an excellent method to keep communication lines open and to prevent bottlenecks from occurring in the first place. During the discussion, be sure to include questions about whether equipment are barriers to meeting production and delivery goals. The holiday season may be the first time a customer is exposed to your brand. At Christmas, it's often a customer's first time buying from your site or retail store and you only get to make a first impression once. Good service during the holidays is critical to having return customers throughout the year. A Mobility Audit can help you determine the issues related to productivity and lack of convenient power. Our mobility audit will quickly help you examine your current workflow, identify areas of inefficiency and provide you with information on how mobility can improve your workplace.